Ever heard of BibleVerse.org? I hadn’t, either, until I was selected to review their product for them. I was really excited to get to do this, since I think the idea of having your name spelled out with Bible verses is crazy-cool!! So for my review of this product, they let me get my own Bible Verse Certificate. How neat, huh?! 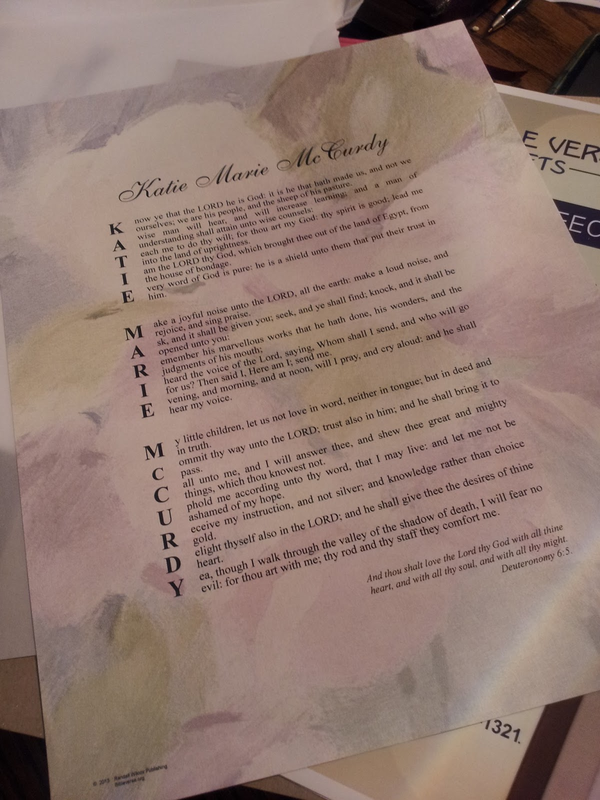 As you can see on the right, I had them put my full name, Katie Marie McCurdy, and it turned out really beautiful! When I went to place my order, I was able to pick from several different backgrounds for the certificate and—of course—write whatever I wanted on it. They were really quick at getting my order to me, and everything was in perfect condition. The paper feels like really good quality and there was even a protective, foggy-looking page that was over the certificate and a hard cardboard behind it to help protect it in shipping. BibleVerse.org not only has these certificates available in English, but Spanish also. Each certificate is sure to be different an unique and there are over 30 different styles to choose from. And for only $12.95, these Bible name certificates would make the perfect gift–and a great encouragement–for a special someone in your life. 🙂 And this is the type of gift that’s not just for birthdays, either. It would be perfect for weddings, baptisms, Mother’s Day, Christmas….or just about any occasion! You ready to find out how you could get your own Bible verse certificate?? Well, now’s your chance! BibleVerse.org was kind enough to offer one of the followers on my blog to get their own certificate personalized exactly how they would like it! I'd probably do my friend's name so I could use it as a super cool present 🙂 Thanks for the giveaway! I am looking to do one for my kids- it would be special! I Would do someone else's name so I can give it as a gift? I think I would do a friend's name so I could give it as a gift also. I'd use my husband's full name, he is a minister and this would be a nice gift for him. it would be hard to do just one of my boys, so i'd probably get this for my husbands Goddaughter. Shes celebrating first communion next month. I think that it would be lovely for my son. I would use my sisters name. She could use some bible loving. I would use it as a gift for my friend Jeni. kristiedonelson(at)gmail(dot)com She would love it! Thanks for the giveaway!